So far we are eating very well here. The district had a traditional feast for the first year teachers. It was the opening for our culture class that is to meet all year. I had my first taste of Aqutak (Eskimo ice cream), seal oil, stink fish, whale and sour dock. 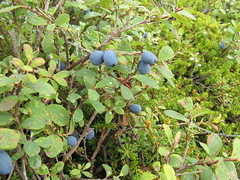 There were also some more familiar dishes of fish, caribou, moose and duck. I liked the smoked salmon and the aqutak made of crow berries and sour dock. I made sure Tom joined me for this special meal too. 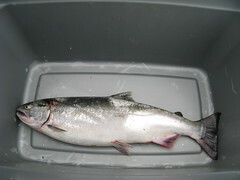 They fixed silver salmon for us the next night. They were caught that morning. Yumm! Tom’s boss had has over for Halibut Friday night and then took us fishing on Saturday. We could only sport fish but Doug and his family could net. We have been told that the Kuskokwim is so muddy that you need to net fish. They caught one silver salmon and gave it to us. It was really too windy to fish. They caught 30 in an hour earlier this week. Most families net fish for their freezers and live off of this supply through the winter. We can net next year when we are residents of AK. For now we will go to the local grocery store for supplies. 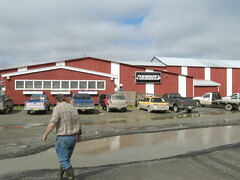 Here is a picture of one of the 3 stores in Bethel. The typical mud puddle is in the front. Note Tom is wearing his Alaskan sneakers.